Print your logo onto these custom printed lunch cooler bags 3.5 lit or one of our other innovative cooler bags & eskis and use them in your next marketing campaign as a unique giveaway item. Our convenient small 3.5 litre lunch cooler bag which is ideal for carrying lunch and a drink. It is manufactured from 210D polyester with aluminium foil laminated foam insulation. the other features include a woven carry handle, a Velcro top closure and an external slip pocket. These are great for school kids or even in the office. Colours include: White, Yellow, Orange, Red, Bright Green, Blue, Black. Dimensions: H 240mm x W 175mm x Gusset 125mm (excl. handle) - Handle Length: 230mm. Prices include a 1 colour print in 1 position. Custom brand these lunch cooler bags 3.5 lit or one of our best-selling promotional cooler bags & eskis with your company logo! 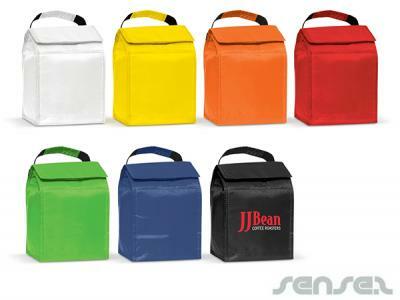 Your promotional lunch cooler bags 3.5 lit can be silk screen printed in 1 or more colours. Costs shown include a 1 colour logo print on your custom branded lunch cooler bags 3.5 lit. We can print more than 1 colour, however it incurs extra costs. We can achieve a perfect PMS colour match for the print. Personalise your lunch cooler bags 3.5 lit or custom design cooler bags & eskis for your marketing campaign. How can these unique promotional lunch cooler bags 3.5 lit or our personalised cooler bags & eskis fit in with your marketing strategy and help you maximise your brand exposure? Our custom made Lunch Cooler Bags 3.5 Lit can be produced from a minimum quantity of 100 pieces. We can have your logo branded on these corporate Lunch Cooler Bags 3.5 Lit in 1 Colour Silkscreen Print or Full Colour Digital Print. A setup fee of AU$160.00 will apply to make the film.